The clocks went back at the weekend, and my garden is looking damp and untidy, so I’m almost looking forward to a touch of frost so we can light the open fire. I have been reading this week that pine cones can be made into fire starters by dipping in liquid wax. I haven’t tried that yet, but I do like to make a display of cinnamon cones every year. Why not make a simple seasonal display of pine cones in a bowl? You could spice up the fragrance by adding a drop or two of cinnamon fragrance oil. If you haven’t been able to collect your own pine cones, they are cheap to buy online. To add the cinnamon fragrance oil to the cones, I prefer to put the cones in a plastic bag and spray with the oil. (Visit the travel department of your local chemist shop for a small handy spray bottle perfect for this job!). I then leave them in the bag for an hour or two for the oil to sink in, before displaying. If the fragrance fades, just repeat this process. If you are shopping for pine cones, I don’t recommend adding fragrance oil to painted cones in case the paint comes off! Make little bags of Christmas by adding fragrance oil to mini pine cones or alder cones in the same way, and fill organza bags to make a lovely little stocking filler. These bags can then be used to fragrance a cupboard or drawer or other small spaces such as your car. 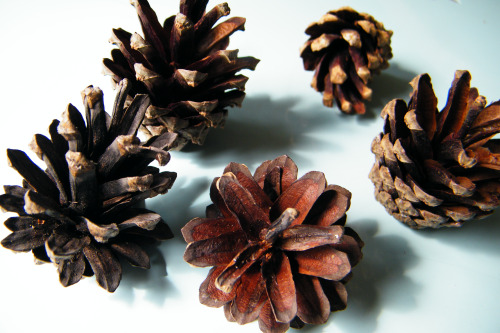 At this time of year we sell large natural pine cones fragranced with cinnamon if you would rather buy them ready-made.